"(Ed Lecoque) sold a puppy to Mrs. Betty Ford of California. The puppy was called Jory of Edgetowne. He sold another, Jolly Arno to Rocky Reach Kennels also in California, Another, Jaunty went further up the coast to some people in Oregon or Washington. All became Champions in very short order. Jory went on to become American Grand Victor in 1951. Mrs. Ford sold half interest in the dog to Langdon Skarda who campaigned him throughout the United States, winning everywhere . 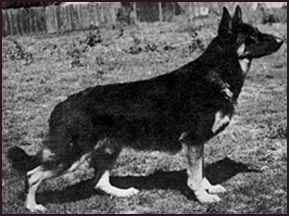 He was universally acclaimed as the best German Shepherd in the country, people would travel miles to attend a show if they thought that Jory was going to be there. He was the premier show dog. Lang Skarda made great use of him also as a stud dog whose influence was far greater than it might have been with his limited use. He died at four years of age. The brothers, Jolly Arno and Jaunty together with his son Nordraak of Matterhorn, practically reformed the breed on the west coast at that time; they took over."